Beautiful setting. Great community. Staff was so helpful and friendly. If you’re lookkg for a social atmosphere El Granado is the place! I booked the girls dorm because I didn’t want to get stuck with a triple bunk. The en suite bathroom was nice and I like that they let me check in early, especially after taking the night bus from Barcelona. The tapas tour with Adam was awesome! I’m still thinking about the warm feta! 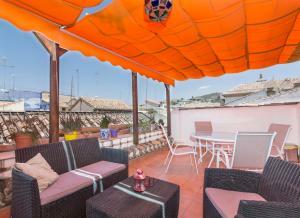 A great place to stay in Granada! The rooms were very clean, and comfortable. The hotel also offers breakfast for 3 euros, which was very convenient. There is also a rooftop terrace, which was a nice place to relax after a long day. The hotel is about 5 minutes walk from the city centre, yet far enough away to avoid the noise of the crowds, and is situated on a nice quiet street. It is also about a 20 minute walk to Alhambra, which was fine for us, because it was a very lovely walk the whole way there. The host was very nice, and very helpful with any questions that we had. Would definitely recommend staying here! The best equipped kitchen so far. Very nice terrace with great views. Finally proper lockers - big enough for two backpacks, no need of your own lock, easily accessible. Recycling here works. Hostel offered occasional dinners for small fee, it had great location, was very clean and had mellow atmosphere. Good location, walkable from train station and from town. We had a private room with private bath. Reasonable size room and bath. Tiny shower with curtain only, but hot water and good pressure. Great older hostel. Even better than last time there. Added large capacity washer and Dryer. Lock in a great price for El Granado – rated 8.9 by recent guests! 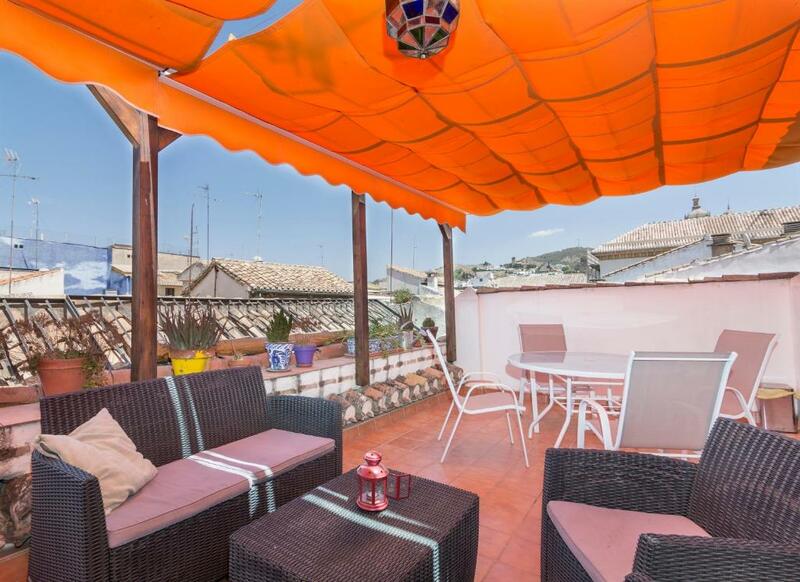 Set on a Nasri-period building from the XV Century, El Granado is on a small street in the center of Granada, just a 5-minute walk from the cathedral. A buffet breakfast and free Wi-Fi are available. El Granado offers elegant accommodations with hardwood floors and modern furnishings, and it includes rooms, apartments, and bunk beds in dormitories. Guests can use the full kitchen and lounge area with TV and computer, or relax outdoors in the courtyard terrace. There are several bars, restaurants and shops near El Granado. The staff is happy to provide more information about the city main sights and attractions, including the Alhambra and Granada’s charming Albaycín neighborhood. The Train Station is within a 15-minute walk of El Granado and the Bus Station is 2 miles away. When would you like to stay at El Granado? This room comes with 1 double bed, flat-screen TV, balcony and heating and air conditioning. Guests have access to a shared bathroom and kitchen facilities, and free WiFi is available throughout the building. This bed in female-only dormitory has bunk beds, heating, reading light and large individual lockers for each guest. Guests can enjoy the en-suite shared bathroom, as well as communal kitchen facilities on the same floor. Free WiFi is available in the room and throughout the building. This bed in dormitory features air conditioning and has wooden frame bunk beds, heating, reading light and large individual lockers for each guest. This bed in dormitory has air conditioning, wooden frame bunk beds, heating, reading light and large individual lockers for each guest. This apartment can accommodate an extra bed for a surcharge. Please contact the property for more information. The Attic is an apartment with its private rooftop terrace. It has a double room, a living room with sofa bed and a kitchen. It is fitted with a bathroom. Free WiFi and two air-conditioning units are available. This double room with private bathroom is fitted with TV, free WiFi, heating and air-conditioning. Please note that extra beds cannot be added to this room type. Babies up to 3 years old can sleep for free in the same double bed. House Rules El Granado takes special requests – add in the next step! El Granado accepts these cards and reserves the right to temporarily hold an amount prior to arrival. Please note that pets are only allowed in private rooms and apartments, not in shared dormitories. Please inform El Granado of your expected arrival time in advance. You can use the Special Requests box when booking, or contact the property directly using the contact details in your confirmation. We absolutely adored the staff. Nice, friendly and welcoming people! The bed is a little small. I am very satisfied with the nice recpetion. Very nice staff and dogs!! Great personal, helpful people. Good design and decoration in rooms and living spaces. Bathrooms not inside the rooms, don't charge extra for things like leaving your luggage with them, large luggage lockers in rooms, common area with social activities and cheap drinks, really nice and friendly staff and atmosphere. It wasn’t a very social hostel when I was there. Besides some of the girls in my room I only saw one other person. Wifi was spoty and our room was a little cold. Our room was very clean and the bed was really confortable. Nothing, it is a perfect place to stay in Granada. I have stayed here 3 times and I am always so pleased with the level of cleanliness, size of the rooms and general fabulousness of the property in such a great location. Room, sheets and pillow covers smelled bad. Walls were a little thin, but not a real issue. Nothing really negative to say about this place, it was amazing! Good location near the cathedral and easygoing hosts. Uncomfortable beds. Too many guests for size of hostal. Communal area and kitchen too small for the amount of people staying there. Staff were helpful and location was good.